Monitor thousands of devices with a single, global event. Global Events are notifications or alerts that are easily configured across 100's of devices utilizing a common Variable Label across the many devices. Imagine deployment 10,000 sensors and wanting to have an alerted covering all of these devices. Instead of creating 10,000 events, you can simply create one Global Event and monitor common variables across a host of devices within particular Device Group. Step 1: From the "Events" tab, click the "Create Event" icon in the upper-right corner. Step 2: Click on “Select Variable" in the Event Configuration. Step 3: Toggle the variable modal window to the "Device Group" listing. 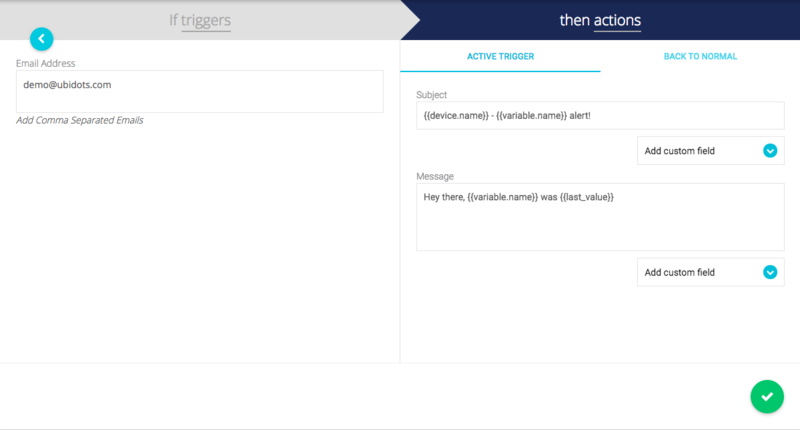 Step 4: Select the Device Group and Variable Label that will act as the Event trigger. IMPORTANT NOTE: Ubidots will automatically populate all Variable Labels that exist across all devices within a Device Group. As an example, we'll create an Event to send an Email alert if any variable with label=temperature is greater than 10. We'll add an Action to send an Email with a custom subject containing the device name. This way, the Email's subject will let us know which device triggered the event. The newly created Global Event will watch out for any changes in the variables with the Variable Label “temperature” within the device of the Device Group "LoRaWAN Devices". For demonstration purposes, when a Temperature value is greater than "10" an email alert will be sent. Note that each Email is coming from a separate device. Important Note: If you remove a Device from the Device Group related to the Event, you will no longer receive notification alerts from that device. Create an inactivity event to inform you if any device has stopped sending data. For GPS tracking applications, create a geofence event to see if any device enter or exit a designated area. Create an alert based on the signal strength or the battery strength of a device. Create an event to inform customers if machines experience unexpected breakdowns or delays. Send an alert when an Event returns "back to normal"